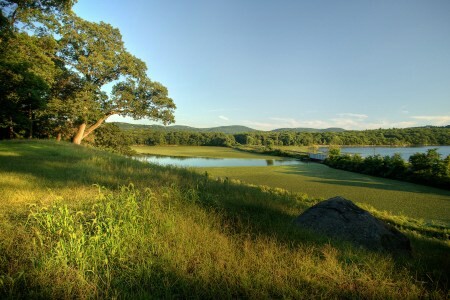 View of the newly protected Kemble Estate property.Robert Rodriguez, Jr.
One of the largest primarily undeveloped parcels in the historic village, this mix of open lawn and woodland sits on a hill overlooking ecologically important Foundry Cove, a popular destination for kayakers and bird-watchers, and is adjacent to Scenic Hudson's 87-acre West Point Foundry Preserve. Within the state- designated Hudson Highlands Scenic Area of Statewide Significance, the land is highly visible from the adjoining heavily traveled Metro-North commuter railroad line, the Hudson River and points on its western shore. Scenic Hudson has added 3.3 acres of the property to West Point Foundry Preserve, allowing it to create an exciting enhancement for visitors—a staircase leading to an overlook offering stunning views of Foundry Cove, Constitution Island, West Point and parts of the Hudson Highlands. In 2017, Scenic Hudson sold the Kemble residence and 9.4 acres around it to private owners who are restoring the house. Scenic Hudson retains a conservation easement on this portion of the property (not open to the public), permanently protecting its natural, scenic and historic assets.